As we roll into 2018 I'm taking stock of my army projects, the backlog of painting and what I can look forward to going forward. My Shadow War: Armageddon kill team is finally finished. I could technically bring the team to ten models, so maybe I'll track down three more Sisters on ebay to round them out. But the slow rate at which I've been able to add models to the team and arm them, there's no rush on that. I've been working on some extras for the game, namely the Necromunda Barricades and Objectives set I received for Christmas. The ammo boxes are painted, and make perfect loot counters. I also painted the exterminatus device from the 40K objectives kit. I used that as the promethium tank in the Raid scenario. I'll chip away at the rest of those objectives and barricades as time allows. I haven't played much of the new Warhammer 40,000 and I'm not sure if that will change with the Malign Portents Campaign coming out for Age of Sigmar. I still want to make a point to paint my Imperial Fist Primaris marines from the starter set sometime this year. I'd also like to add a Redemptor Dreadnought because that looks like a great kit, and I have an idea for converting its arms to resemble the more "boxy" look of the classic dreadnoughts. 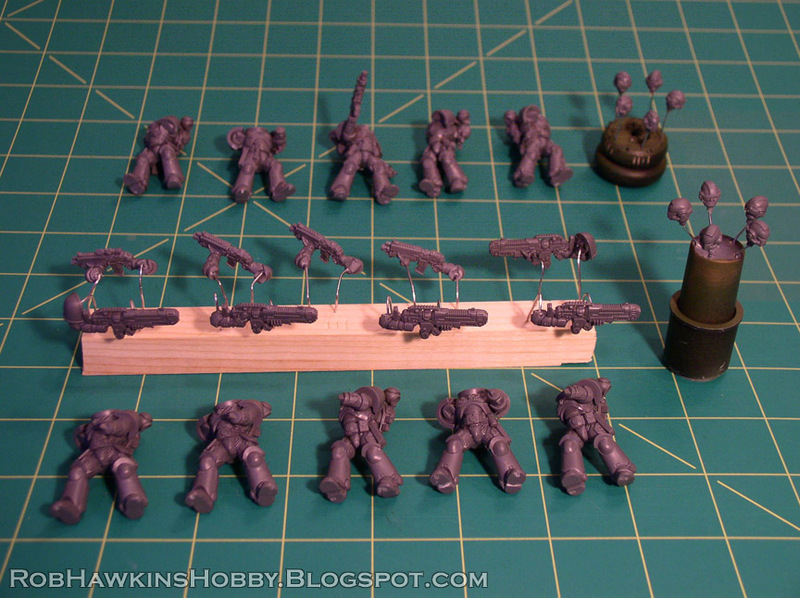 I'm also sculpting a set of industrial bases for my Skull Forge Scenics range that I'll be using for the basing. The Malign Portents campaign is coming soon, as is the Legions of Nagash battletome. 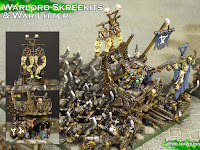 I think we're still about six months out from any new undead models, and I don't know if what they release will slot into the existing undead range or be a completely new stand-alone army in the same way the Kharadron Overlords were their own separate force apart from the traditional Duardin. The press release on the Legions of Nagash book said that it will contain warscrolls for every undead model released (so far). 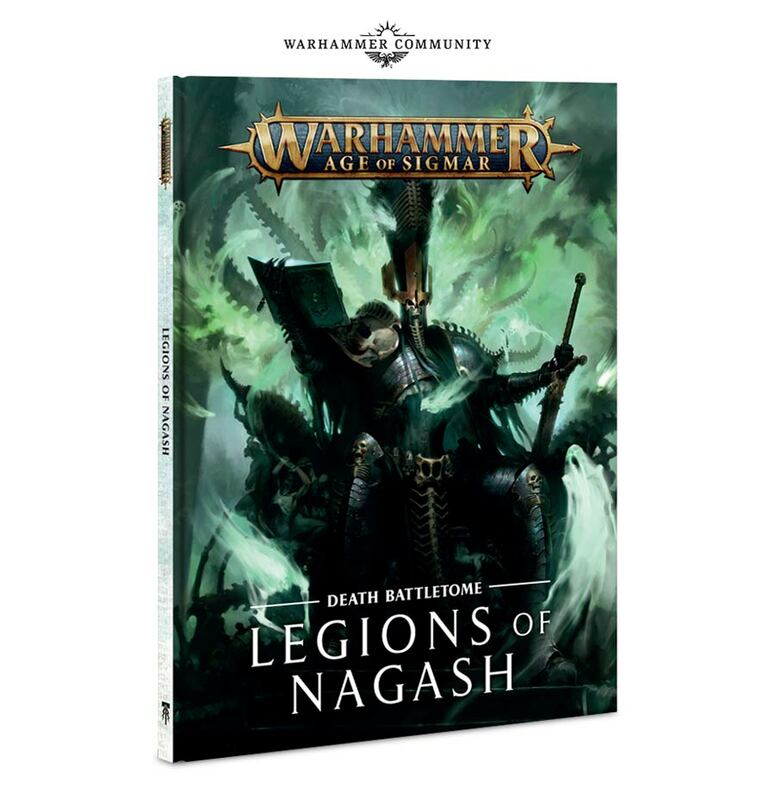 Clearly new Death models are coming, but I don't know if they will be in the Legions of Nagash book, or if it will literally only have the models "so far" and the new army will receive its own, separate Battletome. I hope not. There has also been speculation that none of the Flesh Eater Courts will be in this book. That wouldn't surprise me, as they have their own battletome and allegiance abilities in the General's Handbook. I wonder if the Legions of Nagash is going to incorporate the Soulblight and Nighthaunt allegiances, or it they will remain allegiances that can be used in addition to the new allegiances in the book. The Maggotkin of Nurgle battletome and its new rules also make me wonder if we will see a new mechanic for summoning. The Nurgle allegiances use a system where the army accumulates points to spend on summoning new units rather than casting spells to summon the units. The summoned models still need to be paid for with the army's reserve points, however. Feculent Gnarlmaw trees add to this pool of summoning points, and more can be brought into play as the game progresses. 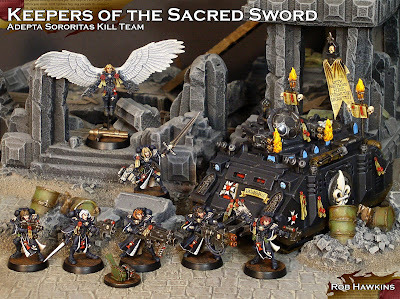 Maybe we'll see a similar system for bringing death models into play. Perhaps the Mausoleums or some kind of mass grave can be unearthed on the battlefield, allowing undead troops to be summoned? Something else I've noticed is all the corpse-parts on some of the new Nurgle models, namely the Pusgoyle Blightlords. Perhaps the corpses mean that a new zombie kit is on the way, and the digital corpses are getting double duty across a few kits in the same manner that the spirit hosts appeared on Nagash and the Mortarchs. I still have my Nighthaunt models waiting to be finished. I haven't had much desire to work on these since the Nighthaunt list is so limiting. It makes me laugh when I see people comparing Nighthaunt lists online, when the only real difference is whether they have more more Spirit Hosts or more Hexwraiths. There just isn't a lot of diversity in the Nighthaunt sub-faction and the limits of what they can ally with only exacerbates the sameness of everyone's armies. Hopefully that will change in the new Battletome. I'd like to finish these models before any new Death models release so I can jump into the new stuff without too much of a backlog. I've decided that the Knight of Shrouds will be my "buy and paint within 48 hours" model for this year's Hobby Bingo. This will be the last hurrah for my Conclave of Corruption. 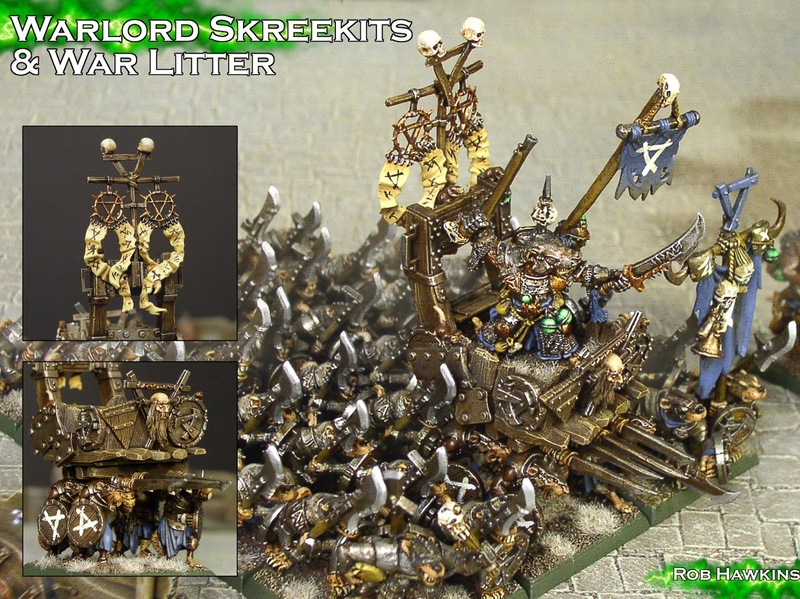 With the new focus on Chaos Nurgle armies, they will be fairly useless when facing them. I've already had a couple games against a Nurgle force, which rendered my Plagueclaws useless (they only wound Nurgle units on a 6). There are a lot of other abilities and tricks that Clan Pestilens uses which either affect Nurgle units on a 6 or not at all. 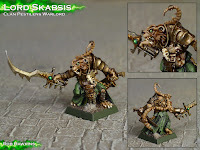 That, paired with the first real attention paid to the Death Grand Alliance in Age of Sigmar's three years, means I'll be turning my focus away from the Skaven and back to my first love. 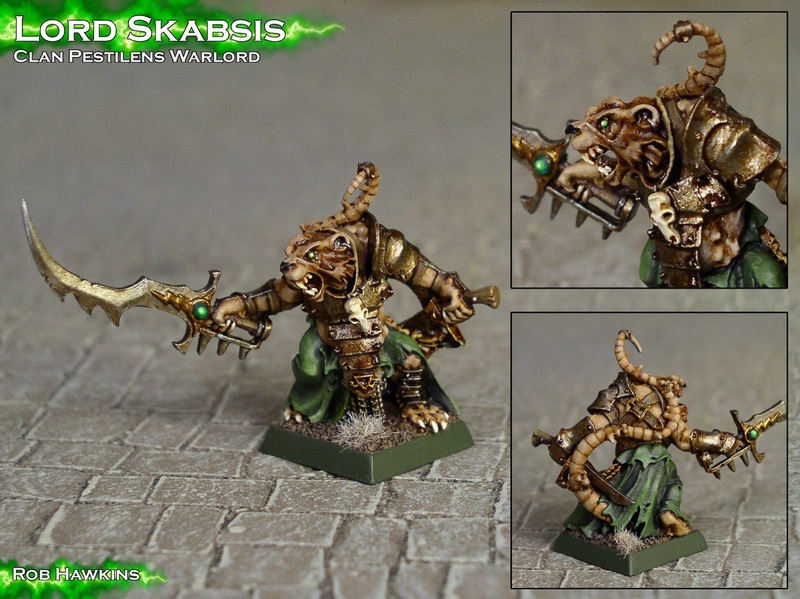 I've finished converting my Plague Priest equipped with the Bilious Bell. 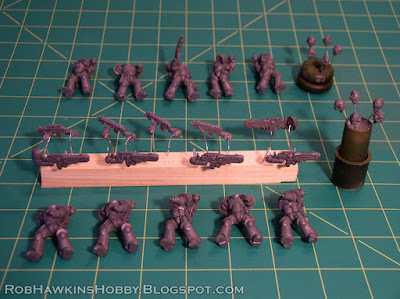 This will check the "convert a model into a totally different unit or character" box on the Hobby Bingo card. I took lots of step-by-step pictures of this guy, so I'll talk about him in a separate post. I also buckled down and finished converting my first Plague Censor Bearers. They're converted out of Plague Monks, rearranged to hold their staves two-handed. The censor flails were giving me the most trouble because I was afraid that the existing plastic chain on the censors would be too thin and brittle for a conversion. I wanted to use spare censors from other kits like the Screaming Bell so they would have the smoke trailing off of them. The solution to the chain was to replace it with "rope" made from two lengths of thin floral wire, twisted by putting one end in a power drill, and the other held with a pair of pliers. The ends were clipped to use as a pin which could be inserted into holes in the censor and the post. Thinner wire was then hand-wrapped around the ends to create the connecting ties. The ropes were then bent into shape atop the flail staves.